Hey! I got up at 5:12 AM two mornings in a row now. And I plan on doing that all this week and all next. I can work for two hours on my ms by doing that. It's quiet cuz even the fella doesn't get up that early (6 or a bit later when he's on holiday). I make a small pot of coffee and settle in. I'm not going to talk about the stupid operating system but other than that - things are cooking on the work. I have a new first chapter in hand - will do a bit of a polish then send it off to my guide through this labyrinth - my mentor, who I will call G. as I haven't asked his permission to out him! It was G's idea as he thought the first chapter was too much info and not enough protagonist. I really like what I've done and even though it will require slightly adjusting every other single sentence (yes - you know it!) it is worth it. As of tomorrow I won't be creating new stuff though. I'll be working the edits and revision. I'll be polishing and sanding and possibly moving a few walls and putting an elevator in. Or a really nice billiards hall just like in my old game of Clue! No! This isn't a mystery and it has plenty of rooms already. 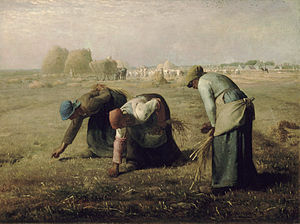 Later... oh and this picture is of an old classic painting called The Gleaners by Jean-Francois Millet. I put it here to remind me of what I'm doing at this point. Thanks Emma - I usually only put up my own photos so there ya go - I've always loved this one though. Maybe too much Hardy in my past. Or maybe it is because it is women working together - so familiar really. I'm going to go look at your blog now...nice to meet you. I get up very early too, Jan. And I love it! It's very quiet and peaceful, and allows me to get my day (and writing thoughts) going. I normally get up between 4:30 and 5:15. I wake my wife up at 5:30 and fix breakfast while she gets ready for work to leave at 6:15 or 6:30 depending on whether she's carpooling or not. I manage to get a few things done before I wake her. It can be a nice quiet productive time.